Margolis and Noonan literally lay out chapter and verse, running down 200 separate entries, spread over a broad range of categories detailing a litany of examples to illustrate their thesis, all backed up with 124 pages of endnotes citing source materials. One of the striking things as you read through this book is the amount of things the mainstream media never bothered to cover, gave passing coverage to or made excuses for during Obama’s White House tenure. You all have bought it, right? Matt and I are grateful for Johns review, and for all those who have read it and told us how much they’ve appreciated our effort. 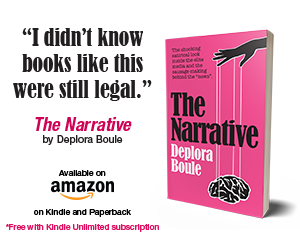 We wrote the book to ensure that the totality of Obama wasn’t sent down the Memory Hole. As Johns points out, we’re sourced to our eyeballs on what we say: it all really happened. And most people simply don’t know about it. Cocain Mitch is winning all down the line for President Trump, and for us. A lot of Trumpsters still say bad things about McConnell…but the reality is that McConnell is Trump’s best man on Capitol Hill. “I can think of nothing more American than to peacefully stand up or take a knee for your rights anytime, anywhere, anyplace,” O’Rourke concluded. So, Ted Cruz is probably going to have to report this as an in-kind donation. O’Rourke’s problem is that he’s marketing himself as a modern Bobby Kennedy…a moderate who cares. But he doesn’t represent Bobby’s Democrat party…he represents Maxine Waters’ Democrat party. And that means he is simply forced to make statements which will make him forever toxic outside the deep, blue areas. Trump deported an old Nazi the other day and, yes, some liberals managed to complain about it. Also, that poor girl who was killed by the illegal immigrant? Well, liberals spent the day deriding her as a mere “white girl” and Warren went so far as to assert that her death must be set aside so we can tackle the important issue of children being separated from their parents at the border. Yes: she really said that. It’s like the Democrats want Trump re-elected. Trump and Cruz square off in Wisconsin tomorrow and if Cruz wins – as is expected via polling – then it will get very difficult for Trump to secure a first-ballot nomination…and that is pretty much the end of the game for Trump because Cruz, who actually understands the process, has been busily securing delegates at State conventions…and even if they have to vote Trump on the first ballot, they will be solid Cruz votes on the second and subsequent ballots. Trump is, naturally, complaining about this – and that, for me, is the final nail in his political coffin. He didn’t do his homework – running for President is a much more difficult and demanding activity than he suspected and voting, especially in the primaries, is only part of the game. I expect him and a large portion of his backers to get all stompy-foot about it and by doing that they may, indeed, wreck GOP chances in November…but given how toxic Trump has become over his alligator mouth, his getting the nomination probably wouldn’t have worked out any different. Meanwhile, Cruz has at least a chance to unite enough of the party and gain just enough cross-over votes to stop Hillary…it would be a hard fight and the money would have to be bet on Hillary, but at least it would be a chance for the GOP, given how massively unpopular Hillary is. If, however, the GOP Powers That Be – who despise Cruz probably more than they do Trump – lock out both of them and hand the nomination to someone who didn’t even run in the primaries or who was knocked out early, then the GOP is definitely doomed – both Trump and Cruz supporters will justifiably cry foul and stay home. Over on the Democrat side, Hillary is the Democrat’s Trump – at least in the sense that she simply didn’t prepare for the contest. And this is a terrible indictment of her leadership ability given that she was taught no end of a lesson in 2008. Hillary had all the money and the entire party behind her and she still can’t put Bernie down. I am still pretty certain she’ll be able to muscle her way to the nomination but she’s day by day turning off the most determined and enthusiastic Democrats. Say what you will about Bernie, but he’s an honest man who is actually campaigning on what the Democrat base wants…Hillary is making a belated lurch to the far left trying to stop him, but the reek of hypocrisy is strong and, meanwhile, she’s providing all sorts of ammunition for the eventual GOP nominee to use against her. A lot of people have said that Hillary is smart – sorry, but I don’t see it. I see not the slightest evidence of intelligence in her actions over her public life. She’s just rote recited whatever current Democrat talking points are, has greedily sucked up as much money for herself as she can and cruelly gone after anyone who has got in her way. She might wind up being President, but she’ll be a lousy President that no one but her sycophants has a kind word for. ‘Cause we’re all going to need to start drinking, heavily – get it? No. No. NOOOO! Because Hillary is prominent it is all the more vital that she be held to the strictest standard. I’ll much easier let some poor guy off than I would someone rich and powerful…because a rich and powerful person (a) can’t possibly have any justification for breaking the law and (b) if those who run the government are breaking the law then every person in the United States suffers ill effects. But this is why Trump is having such a huge effect – because this and 10,000 other examples are out there of people juiced in getting a free ride. This sort of thing must end if our nation is to be saved. Which is all very true but which might not be true for 2016. We only have a few bits and pieces of information to contradict the polling and political history…but if Trump can pull into his camp numbers of those who don’t vote along with some who normally vote Democrat, things could be very much up in the air. I hate to state the obvious, but I guess I’ll have to: people become terrorists because they want to. There are people out there who get a kick out of doing bad – from the drug smuggler to the bank robber to the identity thief to the terrorist. It is true that some times you can talk a person out of doing bad – appeal to their better nature. There are also times when it seems pretty clear that God intervened and a bad person saw the light and repented. But there are also people who, for a variety of reasons, can’t be reasoned with and refuse the call of God. These are the people who make the bad things happen – for run-of-the-mill criminals there are the police, courts and jails to deal with them…but for those who are determined to set off bombs in random public places, much more stern measures will be required. One thing certain, if you’re sitting there spinning mental cobwebs trying to figure out some sort of root cause of either bank robbery or terrorism, you’ll be failing to deter either the robber or the terrorist…you’ve got to take vigorous, positive steps to stop them. If there is some sort of root cause, you can work on that, too…but, meanwhile, you’ve really just got to get after those who do bad things. Much argument these days on what a Conservative actually is – my two cents: a Conservative is someone who understands and believes the fundamental dogma of Original Sin. You don’t actually have to be a believer to hold this (though it’s easier if you are), but if you don’t work on the assumption that people can, even from the best of motives, get it wrong then your own policy ideas will eventually fall apart. Trump is going to get crushed in an epic landslide – or, maybe not. You know me – I’m not really in favor of all these late night, no-knock raids by police…but Belgium’s policy of no raids between 9pm and 5am is, well, stupid. Georgia is debating a bill which would provide just a tiny bit of protection for those who want a conscience exemption – you know, not having to do things like hire people to work at the Church school who openly disbelieve in Church teaching and that sort of thing. Now, pay attention, Conservatives: Big Corporation is stoutly opposed to this. Big Corporation is even threatening boycotts of Georgia if the people there have the nerve to demand freedom of conscience. Big Corporation – and the so-called Capitalist system it lives in – is against us, folks. They are allied with liberals – and please let that sink deep into your heart. Australia banned guns – and this led to the end of guns in Australia and everyone is now happy and peaceful! Just kidding – it has actually generated a violent black market in guns. Scott Walker thinks that brokered convention will lead to a non-candidate getting the nod. I can think of at least one person I’d rather have than either Trump or Cruz. Can you? After all, if we are doomed to President Grifter, then I’d rather have us lose under an honorable banner. Colorado’s dope industry is doing well – smoke a blunt for prosperity! I’ve seen people saying that in a choice between Trump and Hillary, Hillary is the better choice. This just flabbergasts me – for all that Trump has done, he’s not as bad as Hillary. Hillary has deliberately lied again and again throughout her public life. I’m not talking about the exaggerations and evasions common to politics – I’m talking about deliberately lying to the American people about what she has said and done. The latest outrage, in my view, is the way she’s claiming that the families of the Benghazi dead are lying about what she said! This is getting very far into the theater of the absurd – and she just keeps going down it. Like Trump, Hillary is incapable of admitting error…but so far Trump’s enormities haven’t lead to the catastrophe which has been Hillary Clinton actions. I can well believe that Trump will wind up as disastrous as Hillary…but to say he’s now, today, worse than Hillary is just silly. For those casting blame for the rise of Trump I do suggest you check one, last place before finishing: the mirror. It is all of us Conservatives who have failed, to one degree or another. Sure, some are far more culpable than others, but each of us had a duty – if we wish to engage in politics, at all – in making our movement palatable to the widest possible cross-section of Americans. If the GOP primary electorate was even 15% African-American, then Trump simply would not have been able to get as far as he did. Whatever happens in November – the Election of Generalissimo Trump or the Coronation of Her Imperial Majesty Hillary I – we Conservatives need to think long and hard about how we get more people into our movement. Watch what people do, not what they say. People are saying that Trump is a massive electoral defeat waiting to happen…but if that were the case, then President Obama wouldn’t be turning up the heat to save Hillary (and his legacy) from Trump. Is the fate of the GOP in the hands of Kasich? Secretary of State Kerry, once again Johnny-on-the-spot, has declared that ISIS is committing genocide against Christians and other non-Muslims. Only a liberal, American government would take more than two days to figure this out…and only a liberal, American government would only make the move when forced to by outraged public opinion. John McCain is in trouble in Arizona – only leads his challenger by 1 percentage point. Question: will McCain seek some anti-Establishment street cred by endorsing “whacko bird” Cruz? Alternately, will McCain toss over the GOP in order to save his own political skin and try to force a vote on Obama’s SCOTUS nominee? GOP Establishment increasingly shows itself willing to rally around Trump – meanwhile, the True Cons grow ever more dismayed by him. So, we might have Everyone But Conservatives for Trump…this year will be strange. Hey, remember Islamist terrorism? It’s still a thing. Instead of appointing a Harvard or Yale lawyer to the Supreme Court, why not someone who lives in the real world? In contested conventions, the guy who starts with the most votes usually doesn’t win it. Reason: If you can’t snag a first-ballot majority, it indicates a firm level of dislike for your candidacy. Those who vote against you the first time tend to dig in their heels and cast about for any reasonable alternative. We’ll see if this comes out like that if the GOP convention is contested.